Does Food Make You Sick ? 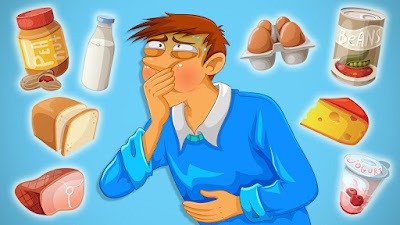 Do you often suffer from strange symptoms after eating certain types of foods ? Do you get itchy, break out in hives, swell up or actually vomit ? You could be suffering from a common food allergy. It’s estimated that over 12 million Americans suffer from food allergies. Most allergic reactions are mild, but around 30,000 visits to the emergency room are reported each year because of the reactions. As many as 200 deaths each year are attributed to food allergies. Studies report up to 8 percent of children have an allergy to some type of food. The numbers are slightly smaller for adults, only around 4 percent. Many children will outgrow their food allergies. But some will carry these allergies into adulthood and suffer from them their entire lives. Eating prepackaged foods, out in restaurants or even friends homes can cause problems. It’s often hard to tell what’s added to the foods we eat. You hate to ask the cook "what’s in this ? ", but sometimes you just have to. Especially when asking can mean the difference between an enjoyable meal and a trip to the emergency room. With the increased cases of peanut allergies, most packaged foods have started including on the label the use of peanut oils and even if the processing of nuts is handled in the same factory. There’s no cure for food allergies. So the only thing you can do is avoid the foods that cause the reactions you can’t deal with.